Leap Frog Dora the Explorer: Pinata Party! Leap Frog Go Diego Go! Animal Rescuer. Leap Frog Dora the Explorer: Wildlife Rescue. The book is "Dora Goes To School" by Nick Jr. The book is in good used condition. There are no tears or writing. I try to make extra money to help my family. This listing is for a never opened LeapFrog LeapTV cartridge Dora & Friends Educational Active Video Mathematics Game. The case is still sealed as you can see but the back has a tag that has a sticker that had to be lifted to get the UPCcode. Shipped with USPS First Class Package. Console only. Batteries are not included. See pics for details. Nick Jr Dora the Explorer - Dora Goes to School. "Dora Goes to School". Get minds and bodies moving with this LeapTV educational active video gaming. Pixar Pals; science skills. Jake Pirates:mathematics skills. 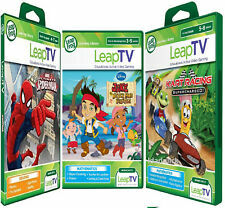 Get minds and bodies moving with this LeapTV educational active video gaming. Get minds and bodies moving with this LeapTV educational active video gaming. Kart Racing;mathematics skills. Jake Pirates:mathematics skills. 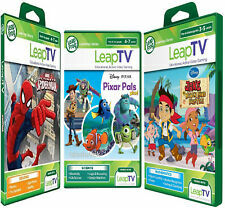 Get minds and bodies moving with this LeapTV educational active video gaming. Bubble Guppies :Science & social studies skills. Sofia The Princess :word sounds, vocabulary, phonics & the alphabet. Focuses on reading. Ages 4-7 years. Written at 3 levels from simple to complex words and sentences and features reading activities for extra learning fun! This listing is for the LeapFrog Click Start My First Computer Game System With 2 Games. Games included are Thomas & Friends, And Disney / Pixar Finding Nemo. System has been tested and works. Does not come with Power Adapter but works just as well with (4) C batteries (not included). See photos and let me know if you have any questions before you purchase. Thanks for looking! Works with LeapTV. New - Dora and Friends - Ages 4-7. 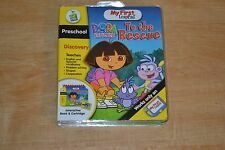 New Sealed LeapFrog Learning Library LeapTV - Dora and Friends - Ages 4-7. Condition is New. Shipped with USPS Media Mail. 2 LeapFrog LeapPad Dora's Amazing Show & Sofia The First Works with all LeapPad tablets Condition is Used. Shipped with USPS First Class Package. Leap Frog - Compatible with My First LeapPad player only. My First LeapPad Learning System. Dora the Explorer To The Rescue. See photos for details. Item shown in picture is the exact item for sale. New, unopened package of LeapFrog Leapster DORA THE EXPLORER CAMPING ADVENTURE Learning Game Cartridge. Explore Spanish words. Condition is new, in slightly damagedpackage but unopened. Shipped with USPS First Class Package. Excellent Gently Used Condition! Teaches the following. LeapFrog Leapster learning game system. Dora the Explorer Pinata Party Letterpillar. Letter games arcade style learning works with all Leapster learning systems value pack. Recommended for pre-k through 1st grade ages 4 through 7 . New in original packaging. Plastic wrap does have a few tears. U.s. shipping only. No returns. Please see pictures and ask questions before buying. Thank you and happy shopping. Teaches the alphabet, vocabulary, and numbers. LeapFrog My First LeapPad Educational Book: Dora The Explorer To the Rescue. Team up with Dora and Boots as they reunite a lost little bird with her mother. Works with LeapTV gaming system. Internet connection may be required for programming update. Help Dora and Friends on a magical adventure! Teaches addition, subtraction, early algebra, spatial reasoning and number sequences. My First LeapPad Electronic Learning System Blue. Console has been clean, tested & works. This lot is used & shows little wear from normal use. Ultra eBook. Works with all LeapPad tablets. New in Box! Features: 3 auto-adjusting levels. Zip, raft, swing and sing your way to learning new Spanish words and phrases with your favorite explorer friends. And with the LeapFrog® Learning Path, parents can see what their child is learning. Appropriate for ages 4 years to 8 years. Features simple sentence structures and words with predictable spelling patterns. Item in photos is exact item sent. We are family operated and care about our reputation. I Spy "Treasure Hunt" (serial number: 8090516AG). Works great, all buttons and attached stylus are in good working and usable condition. The Penguins of Madagascar "Race for 1st Place!". (serial number: 00623181G). Dora the Explorer. Dora Goes to School. Almost all my books are from LeapFrog. This is nothing major but I wanted to point that out to you. taking pictures and select the best ones to show. The book shown in the pictures is the. Disney - "DORA the EXPLORER". Problem Solving. I am sure we can work any problems out! Plan ahead when ordering to allow for delay with your. If you want. Compatible with My First LeapPad system only. Just ask for a combined invoice! Item is in Great Condition!